There is a tradition in many households that includes a seafood meal on Christmas Eve. 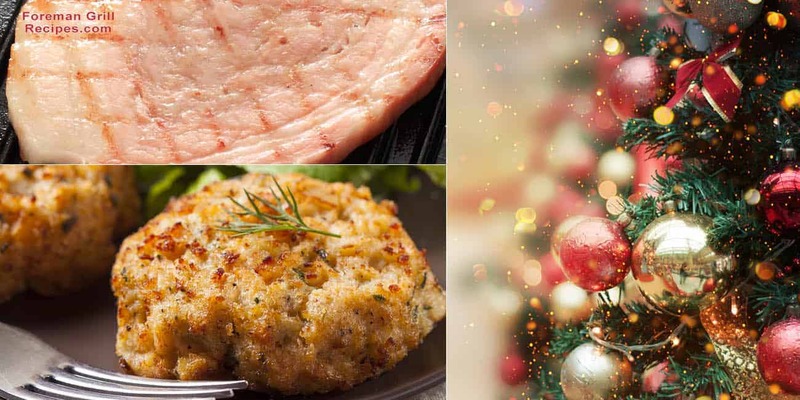 In our house, Christmas Eve has always been the main meal of the holiday with either poached fish or crab cakes as the main attraction. Christmas Day is reserved for relaxing and eating a late brunch after the gifts are opened. Dinner is usually a nice family meal with something roasted. There is always one family member who arrives on Christmas Eve with a bone-in honey cured and smoked ham as a gift. We put that aside and reserve it for our brunch. Of course, it is enormous, so I do end up making split pea soup with ham and vegetables for the freezer and future winter meals. We’ll explore a Christmas meal using the Foreman Grill to make the seafood main course and a side. We’ll also use the grill for our brunch. This is an eggless recipe so that it is guaranteed to cook all the way through. The recipe should make 8 to 12 crab cakes. You can double it to make more and just keep the cooked ones in a warm oven. You can always make the cakes ahead of time and freeze them until you are ready to grill them. Just remember to thaw them completely. 1. Combine the first 6 ingredients in a large mixing bowl. Mix in 3/4s of the cracker crumbs. 2. Break the crab meat up a bit with your hands. Then, gently fold the crab into the mixture in the bowl. Scoop out 1/4 cup portions of the crab cake mixture and form into small patties. Place in the refrigerator for 15 to 30 minutes to firm up. 3. Preheat your Foreman Grill to high. 4. Place the remaining cracker crumbs on a plate. Press the each cake into the crumbs to just lightly coat on both sides. This will give added texture. 5. Coat the top and bottom plates of the grill with EVOO. Grill the crab cakes for 5 to 10 minutes until golden brown and heated through. This will take 2 or 3 batches. Keep cakes in a low temperature warm oven until ready to serve. 6. Serve with lemon wedges and your favorite tartar sauce or spicy cocktail sauce. These pair well with a fresh lettuce and herb salad and some grilled Brussels sprouts on the side. I love fresh salads with crab or fish cakes. The easiest way to make this is to pick up a couple of packets of organic spring salad mix or baby salad greens. These are already triple washed. Simply place the greens in a large salad bowl and dress with 1 part lemon juice to 2 parts extra virgin olive oil. Season with salt and pepper. It doesn’t get any easier. Serve the salad with 2 crab cakes right on top, along with your dipping sauce and another side. I haven’t always been a fan of Brussels sprouts because they are often hard and don’t smell that great. The trick to getting them softer and less odiferous is to preheat them in a microwave for a few minutes before grilling. 1. Cut the Brussels sprouts in half lengthwise. In a glass bowl, microwave the Brussels sprouts on high for 3 minutes. Set the bowl aside to cool for a few minutes. 2. Preheat your Foreman Grill to high for 5 minutes. 3. Place all the other ingredients in another bowl and whisk until well mixed. Add the Brussels sprouts and toss to coat. 4. Grill the Brussels sprouts, cut side down, with the top closed for approximately 6 minutes. You might have to do this in 2 batches. It is OK to crowd the grill for this recipe, as that keeps the moisture in. Test your sprouts at 5 minutes to see if they are fork tender. 5. Serve with crab or fish cakes. I remember as a child waiting anxiously to get into the family room where the tree was to see what Santa had brought. We had to wait until my parents were awake. That was the rule. Then, we had to wait for my dad to make a pot of coffee. It was sheer torture, but worth the wait. After we opened gifts, my parents would both take on the task of preparing brunch while we played. My mother made a huge pot of scrambled eggs with butter in a double boiler. It sounds odd, but they were creamy and delicious. One of us would help make biscuits, using a popular box mix. And, my father would get on the indoor grill to fry up some ham steaks and any other tasty breakfast meats we had on hand. I don’t think we ever got out of our pajamas. As an adult, I still claim Christmas Day as an official pajama day and always have an easy brunch with some grilled ham, sausage, or bacon on the Foreman Grill. Remember that gift of a large cured ham? To grill ham steaks you simply need to slice the ham into 1/2 inch thick slabs. Butter or oil your preheated Foreman Grill. Place the steaks on the grill and close the top. The ham is already cured and cooked, so these take just a few minutes to heat through. The sugars in the ham will caramelize and help to get some really nice charred grill marks on each side. This is delicious served with maple syrup, hot buttered biscuits, and creamy scrambled eggs for a great and easy holiday breakfast. Amazon Associates Disclosure ForemanGrillRecipes.com is a participant in the Amazon Services LLC Associates Program, an affiliate advertising program designed to provide a means for sites to earn advertising fees by advertising and linking to amazon.com.